The brain undergoes many phases of growth and development from birth to adulthood. Much like a tree it’s difficult to notice the day-to-day changes, until finally we see the vast progress that’s been occurring all along. The brain works around the clock to trim and optimize our brains. Let the magic begin! Babies are born with nearly 100 billion neurons, which is all the brain cells you ever need. Amazingly, there are almost the same number of neurons in the brain as there are stars in the Milky Way Galaxy. Each brain cell has several thousand finger-like projections extending from both ends which connect and communicate with neighboring brain cells. These connections are called synapses, and billions of new ones are created each second in the early years of life! There are distinct periods in life when the brain is ready to absorb and learn certain skills. Parents and families play a fundamental role in the brain’s development. Things like baby-talk, smiling, and making funny faces with babies is critical for early neurological development. During these interactions, babies learn to identify and mimic emotional cues, sounds, facial expressions, and gestures. It may seem trivial, but these interactions actually create the foundation for future learning and social interaction. You are born with all the brain cells you ever need (over a billion). Since brain cells don’t multiply over time, what actually helps us learn new things is an increasing number of synaptic connections per brain cell. Synapses are made mostly of white matter lipids - therefore brain maturation means synapse formation. The early stages of neuronal growth are known as rapid proliferation. Neurons lengthen and create billions of new connections each day as the child learns and adapts to new experiences. 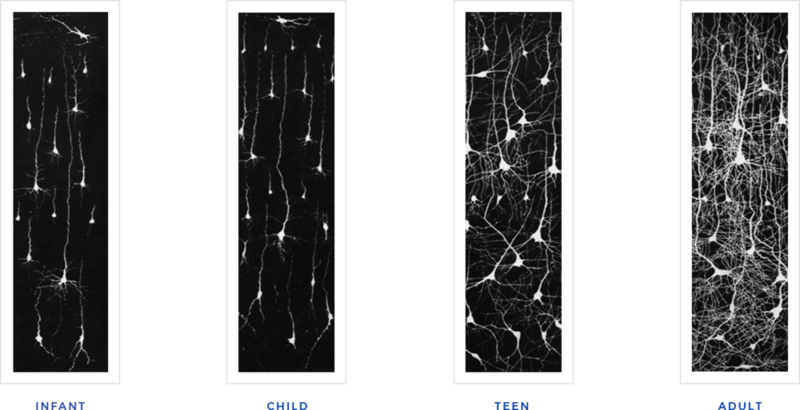 Neurons expand and create new connections similar to how the branches of a tree extend and multiply; and let’s not forget trees extend at both ends. By pruning and trimming its tiny neuron branches, the brain is able to learn more complex and specialized tasks. This process varies from person to person and is influenced by experiences, activity, nutrition, and genetics. The nutrients we provide the developing brain are critical. Nutrition greatly affects the structure and function of brain cells, especially in the early years when the brain is growing faster than it ever will. By supplying the brain with proper food, activity, and education, the brain is able to grow strong so it can pay us back later. It’s no secret, prenatal vitamins are some of the most important nutrients that the developing brain ever gets, but brain development doesn’t stop at birth, and neither should proper nutrition. The incentive is better cognitive ability in the future! The evolution from child to adult begins in the brain. Specific glands in the brain drive this process, releasing hormones into the bloodstream to initiate maturity all throughout the body. These chemicals are extremely powerful. As the mind adapts to the new blood chemistry, youth experience a change in overall interest and personality. Adolescents don’t get enough credit, it’s quite a feat dealing with life when there’s a river of hormones flowing through the body. Hormones travel through the bloodstream, but emotions originate from electrical signals. These signals travel along neurons until they reach the endings, and specific chemicals are released. Once released, these chemicals travel from one neuron to the next through a small gap known as the synapse. There are many different neurotransmitter chemicals which influence mood, behavior, focus, attention, and overall vitality. A healthy balance of neurotransmitters is crucial for a sound state of mind and are greatly influenced by nutrition, exercise, sleep, and environmental variables. The final checkpoint is the prefrontal cortex. This is the part of the brain that influences things like attention, behavioral maturity, decision making, and strategic problem solving. Surprisingly, this lobe of the brain is not complete until we are nearly 25 years old. All the more reason to lead by example when around developing brains, because you never know who’s brain you’re influencing. The brain feeds off of experience. As skills are learned the brain creates new pathways to coordinate with the body. Activities like sports, music, and art impact muscular development, coordination, and strategic thinking. The brain also coordinates through social interaction. During this decade personal identity, self-esteem, and self worth are established and fostered. Just another example of brain development, helping us to gain a new psychological perspective of the world. Before now, neuron synthesis was rapid and significant. By now the number of neuron connections extending from each brain cell has reached nearly 15,000. Once neural pathways are established it becomes more difficult to alter the layout, just as it becomes more difficult to build more roads in a crowded city. For the brain to continue on a positive trajectory, it requires some essential elements. This means proper nutrition, exercise, sleep, and stress management. By maintaining good habits, we are allowing ourselves to have adequate energy, DNA protection, strong brain tissue, neuronal health, and emotional balance. Regardless of age, science shows that our everyday efforts continue to shape the brain throughout our life. While we may not be able to learn a new language with ease, neuron pathways continue to form and the brain continues to change well into adulthood. Science reminds us that we maintain the ability to thrive throughout our entire life. So never stop learning and continue seeking positive experiences for optimal neuroplasticity. In the next section we talk about the brain as it continues through life. Your future starts now!